The 'Manage Projects' form is the page that displays all StaffMap projects. Users can access this form by opening the StaffMap file directory ('Website.com/StaffMap/' or 'localhost/StaffMap2/'). An administrator can password protect this form from public users visiting this form. Users will be prompted to enter a password in order to use this interface. 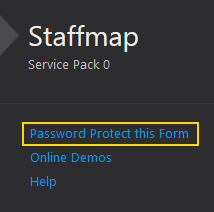 This is useful if StaffMap is installed as a web application on a public server, or if you want to limit control of the form on an intranet to administrators only. Open StaffMap to the Mange Projects Screen ('Website.com/StaffMap/' or 'localhost/StaffMap2/'). Click on the 'Password Protect this Form' link on the left hand side of the screen. In the resulting window, enter a password twice and press 'OK' to confirm it. 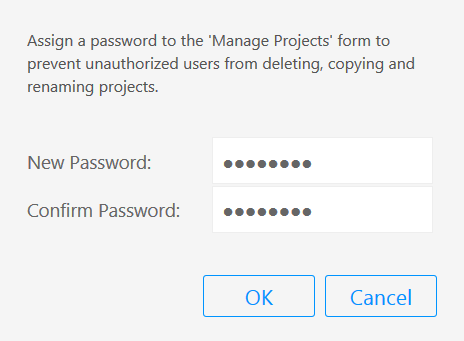 Now a user opening StaffMap will need to input a password to see the 'Manage Projects' form.